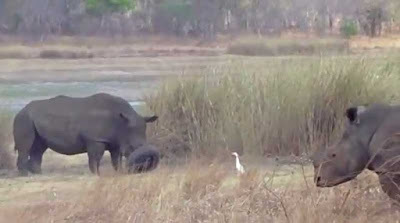 Vets had to be called in to rescue a wild rhino that got a tyre stuck over its snout and was unable to eat or drink. The animal, which was in one of Zimbabwe's rhino protection zone parks, became entangled in the tyre which had been dumped in a watering hole on the site. 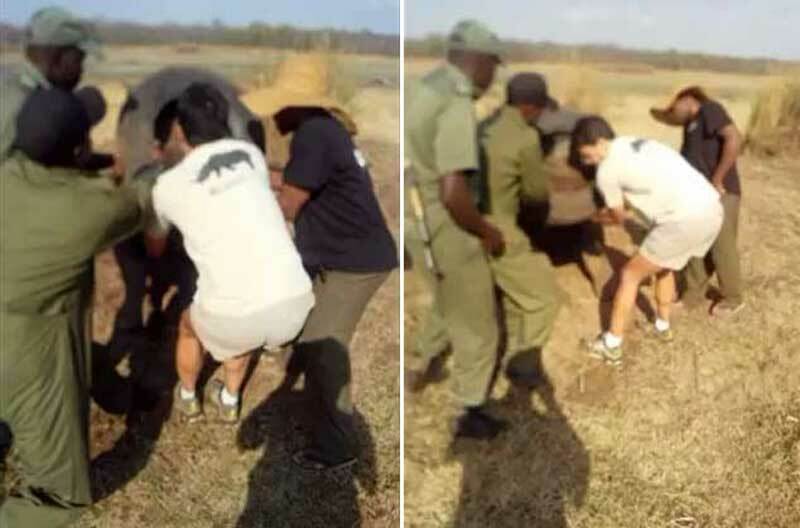 Rangers alerted vets from the Aware Trust Zimbabwe charity who came and tranquilised the white rhino, called Mark by park workers, before carefully removing the tyre. A spokesperson for Aware said: "Rangers thought he'd be able to dislodge it himself but as he continued to thrash around in frustration it became apparent the tyre was firmly stuck behind his front horn stub. "No amount of straining was going to enlarge the tyre's central hole. Mark's mouth was bound firmly shut and he couldn't eat or drink. We found Mark, the dominant bull, lying close to his girlfriends, looking decidedly dejected and exhausted from his ordeal. Fortunately the tyre came off in a few minutes with man power, and we did not have to resort to cutting through it. YouTube link. Original Facebook video. "Eleven minutes later he was antidoted and grazing again as if nothing had happened." 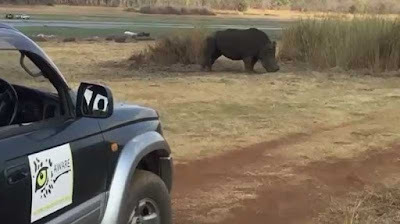 The spokesperson said that because the part of Zimbabwe where the park lies is suffering from a drought, the lake where the animals get their water has receded and pollutants such as tyres and nets are emerging frequently.